It shows emails with all properties like; Email Subject, Sent date, Received date, Read/Unread status & Size of Email after successfully loading all emails from PFC mail storage. 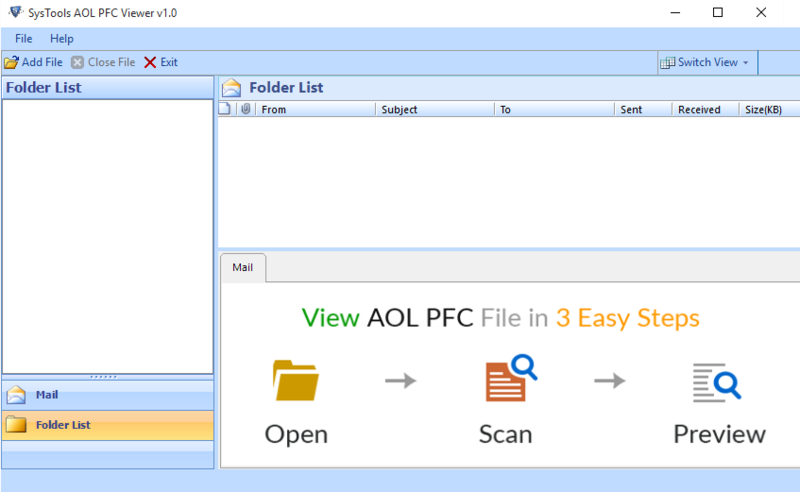 AOL PFC File Opener software provides facility for its user to view emails with all attachments name & file type. Users just need to select an email to view its attached items name. 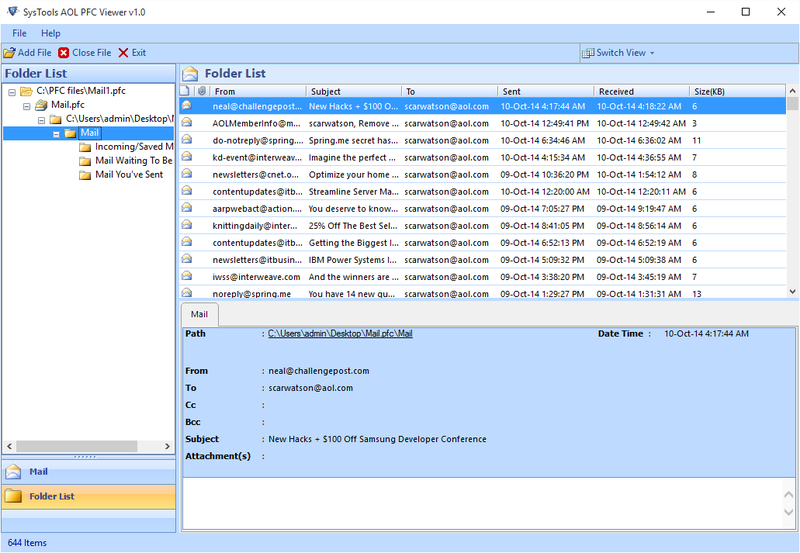 This software allows users to view items according to folder hierarchy like Inbox, Outbox, Draft, Spam, etc. This software is freely downloadable and accessible from any location. Users just need to install into their machine to use it but it can only be installed in Windows Operating system. What is AOL PFC File Extension? PFC file is created by AOL Email Client with .pfc file format. PFC is known as Personal Filing Cabinet and it is kind of personal cabinet filled with emails that's why it is also known as Email Store. AOL Email Client store all emails locally on Hard Disk Drive. AOL PFC File reader can be useful for reading emails from file having .pfc extension. This software can be useful in many ways for users like if any user was earlier using AOL Email Client and now the user has uninstalled it. Then to view an email from PFC email store the user will need to download AOL PFC file reader to open emails quickly and free of charge. Another situation can be, if a user has logged on as a guest and needs to open emails but isn't able to read because AOL Desktop can't be accessed by a guest account. Then in this situation, the free AOL email reader software can be downloaded to open emails easily. Need to Open AOL PFC File? My AOL profile installation had been done on a different machine than the one I was carrying during my business tour. I am thankful to this tool to open AOL PFC file by which I got access of emails without a platform! I was using AOL desktop for email services but since the last 4 months, I am not using AOL anymore. However, now I need to view an AOL email saved in my machine in a PFC format. So, can anybody suggest a tool for this? 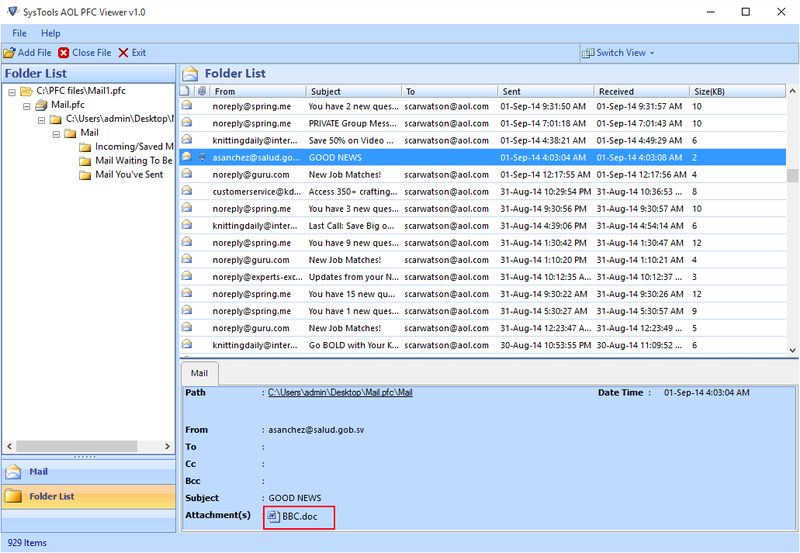 You can use EmailDoctor PFC File Opener software to view & open AOL PFC file emails stored on the machine in PFC file and you just need to select location of PFC file from your computer. I have heard a lot about this tool. Can you please tell me whether it can read my emails with attachments or not? Yes, this tool reads emails with all attached items but you cannot access the attachments. You can only see the name and extension of attached files. Hi, I am David from LA. I am not from a technical background; I want to ask some questions related to the IT field. I am using AOL for accessing emails and I have saved important emails in different folders as backup. Can anybody tell me how can I open my saved emails in Google Chrome? Hello David, you can use AOL PFC Reader to extract your emails from backup and save those emails in HTML format. Then your emails will be accessible in Google Chrome. We found no alternatives for reading the emails of our PFC files other than AOL. However, the requirement was a little urgent and the setup would take time. PFC Reader proved to be a great help at the time. Thanks to the entire team behind AOL PFC Reader freeware program. We are fortunate to have such a solution free of charge. The hassle free installation and easy operations made it our favorite. A situation that could have been full of misery turned out to be a very smooth one. We didn't realize the PFC Reader would be such a great help for us. Available as a freeware made it more desired. We couldn't have received a greater help than what this tool has done for us. PFC Reader is a solution worth having if you are an AOL account user. You can be abandoned anytime from the client.